The General Motors EV1 was an electric car produced and leased by the General Motors Corporation from 1996 to 2003. It was the first mass-produced and purpose-designed electric vehicle of the modern era from a major automaker, and the first GM car designed to be an electric vehicle from the outset. The decision to mass-produce an electric car came after GM received a favorable reception for its 1990 Impact electric concept car, upon which the design of the EV1 drew heavily. Inspired partly by the Impact's perceived potential for success, the California Air Resources Board subsequently passed a mandate that made the production and sale of zero-emission vehicles a requirement for the seven major automakers selling cars in the United States to continue to market their vehicles in California. The EV1 was made available through limited lease-only agreements, initially to residents of the cities of Los Angeles, California and Phoenix and Tucson, Arizona. EV1 lessees were officially participants in a "real-world engineering evaluation" and market study into the feasibility of producing and marketing a commuter electric vehicle in select U.S. markets undertaken by GM's Advanced Technology Vehicles group. The cars were not available for purchase, and could be serviced only at designated Saturn dealerships. Within a year of the EV1's release, leasing programs were also launched in San Francisco and Sacramento, California, along with a limited program in the state of Georgia. In 1999, GM released a Gen II version of the EV1. Major improvements included lower production costs, quieter operation, extensive weight reduction, and the advent of a nickel-metal hydride battery. The Gen II models were initially released with a 60 amp-hour Panasonic lead-acid battery pack, a slight improvement over the Gen I power source using the same 312 V voltage; later models featured an Ovonics NiMH battery rated at 77 Ah with 343 volts. Cars with the lead-acid pack had a range of 80 to 100 miles, while the NiMH cars could travel between 100 and 140 miles between charges. For the second-generation EV1, the leasing program was expanded to the cities of San Diego, Sacramento, and Atlanta; monthly payments ranged from $349 to $574. 457 Gen II EV1s were produced by General Motors and leased to customers in the eight months following December 1999. According to some sources, hundreds of drivers wanted to but could not become EV1 lessees. In late 2003, General Motors, then led by CEO Rick Wagoner, officially canceled the EV1 program. 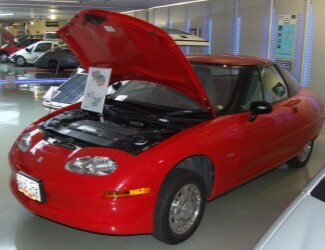 GM stated that it could not sell enough of the cars to make the EV1 profitable. In addition, the cost of maintaining a parts supply and service infrastructure for the 15-year minimum required by the state of California meant that existing leases would not be renewed, and all the cars would have to be returned to GM's possession. At least 58 EV1 drivers sent letters and deposit checks to GM, requesting lease extensions at no risk or cost to the automaker. The drivers reportedly agreed to be responsible for the maintenance and repair costs of the EV1, and would allow GM the right to terminate the lease if expensive repairs were needed. On June 28, GM famously refused the offer and returned the checks, which totaled $22,000; By contrast, Honda, which had taken similar actions with its EV+ program, agreed to extend its customers' leases. In November 2003, GM began reclaiming the cars; several were donated to museums and educational institutions, albeit with deactivated powertrains meant to keep the cars from ever running again, but the majority were sent to car crushers to be destroyed, allegedly with government permission to do so.